Sometimes things happen in life that are out of your control. Losing you job, a health problem or any change in your life can cause havoc on your finances. There are times when you must reach out for help and there is nothing to be embarrassed about. Our children are more important than our pride! If you are having trouble financially you may find yourself feeling down. You may find these Motivational scriptures that will Help you Get Back Up to be helpful while you are going through a tough time. Don’t get down on yourself about being a better mother or father. Just because life has thrown you a hard time doesn’t mean you are a bad parent. In fact, you are actively trying to make life better if you are trying to find free food so don’t be so hard on yourself. We all go through hard times and those times eventually end. Just keep praying and trying and you will get yourself through. How to Be a Stay at Home Mom When You Just Can’t Afford It! If things are tight financially, you may find yourself unable to afford the cost of food. Here are some tips on how to find free food without begging for it. The first thing you should do is find out if there’s a local soup kitchen. Many people assume that soup kitchens only feed the hungry during the holidays, but they actually operate all year round. You can also check out local food pantries. While food pantries offer food to those in need, they rely heavily on donations and sometimes there just isn’t enough to go around. Another thing you can do is go to grocery store openings. While grocery stores periodically offer samples, they’re more likely to do so during their grand openings. Find out when free food is offered by chain restaurants. For example, Dunkin Donuts usually offers customers a free donut and beverage on National Donuts Day. Rita’s offers free Italian ice on the first day of spring. Of course this isn’t a long-term solution, but it can get you a free treat. You may also want to consider getting a job at a restaurant. While some restaurants offer their employees discounts, others let their workers eat for free. This can be a great way to make some extra money and get some free food in the process. Some restaurants may give away food at closing time. Find out if there are any restaurants in your area that do. You could also try bartering. That is where you actually do something for someone else and instead of money you would get food. Some odd jobs you could offer are…. Taking their children to the park. As you can see, you don’t have to go hungry. 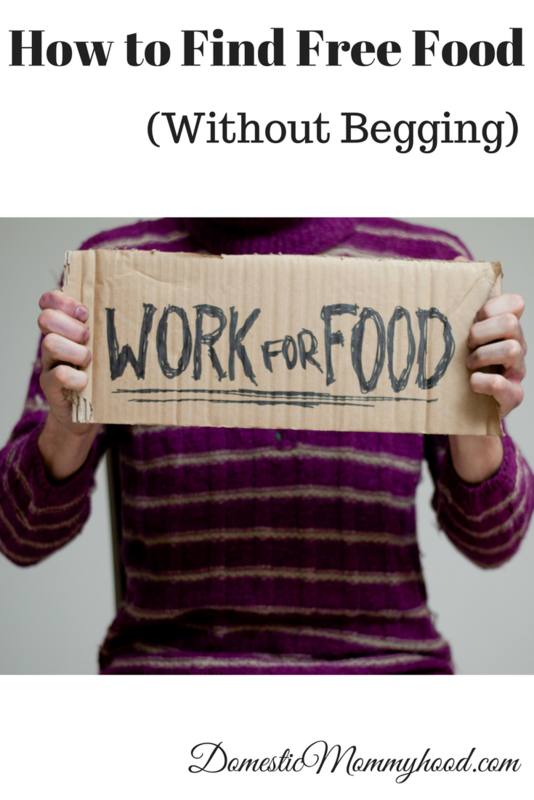 There are a number of ways you can find free food without begging for it. Here are a few articles you may enjoy reading from my great blogging friends.